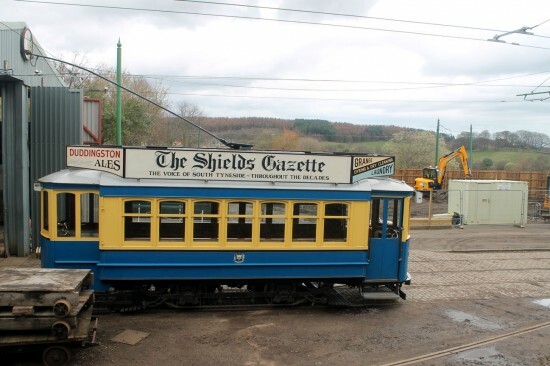 With it now being less than a month until the Great North Steam Fair kicks off at Beamish it is very much the lull before the storm – especially with it being outside of school holidays as well – with most days seeing up to a couple of trams in service. On Tuesday 19th March the weather was warm enough again for the two open-toppers to be the service cars: Blackpool 31 and Newcastle 114. 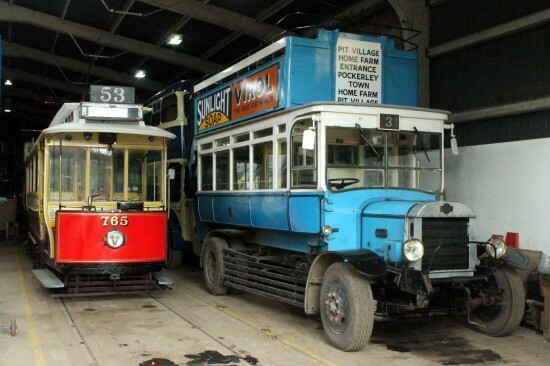 Meanwhile, Oporto 196 was on stand-by stabled outside the depot with Manchester 765 visible resting in the depot alongside the replica London B type bus. Oporto 196 stabled outside the depot. Beyond the tram work is now well underway on preparing the site for the new bus depot.